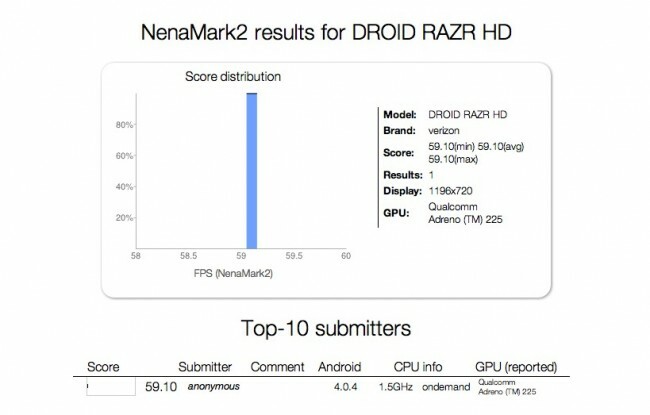 The DROID RAZR HD appears to have stopped by Nenamark within the last few days to pop off a benchmark and give us a look at its specs. From this result, we can see that it indeed does have a Qualcomm Snapdragon S4 dual-core processor clocked at 1.5GHz. How can we tell? Because of the Qualcomm Adreno 225 GPU listed here that accompanies this chipset. We can also see that the device is running the newest version of Android, 4.0.4, and that it has an HD 720p screen with a resolution of 1196×720. Normally when we see that 1196 instead of the full 1280, we assume that it has on-screen navigation keys that are taking up a few pixels. Other than that, we see “Verizon” as a brand and a score that matches up to other Snapdragon S4 phones. If you want to see what the phone looks like, you are in luck because we posted the first pictures of it today. Our source confirms that the device has on-screen keys and a beautiful HD display. No word of a release date has been mentioned, but I’d guess we are still at least 5-8 weeks away.